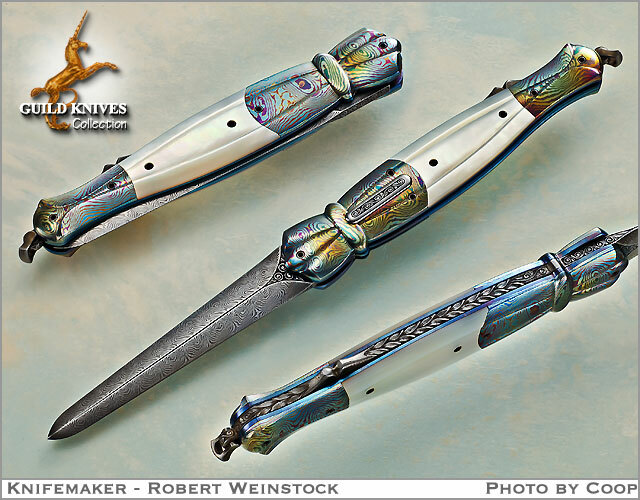 Few autos have come off of Weinstockâ€™s work bench and this one is the most rare he has ever made. Tamascus, which is a titanium damascus was his material of choice for this knifeâ€™s 4 carved bolsters, but never again. It is a most superior and singular material, with attributes way beyond those of steel damascus, EXCEPT for one thing: it is a the most difficult material to work, due to itâ€™s hardness, that Bob had ever encountered. Countless hours were spent in chasing and carving this knife. The results: utterly fabulous and the best knife that he has ever made, in my opinion. Carved ricasso, blade back, rocker bar, and entire spine. Yipes!